I’ve always found Apple’s Font Book application to be the ugly stepsister of the native Apple applications. It just doesn’t have the polish of most Mac applications. It seems everytime I need to find a unique font for a graphic or presentation, Font Book gets in my way. This is what led me to Bohemian Coding’s Fontcase. Fontcase looks like something designed by Apple. 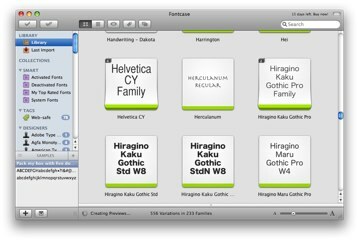 Specifically, if the iTunes team made a font manager, it would look a lot like Fontcase. The initial Fontcase import is painless. You click one dialog box and Fontcase does the rest. 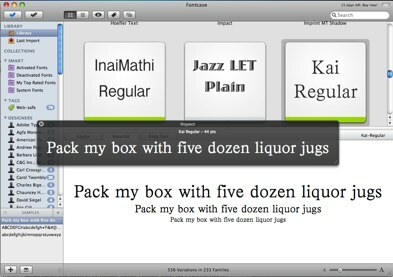 Fontcase can preview both active and inactive fonts. This means you don’t have to load all of your fonts in memory. Instead, you keep them all in Fontcase and activate when needed. 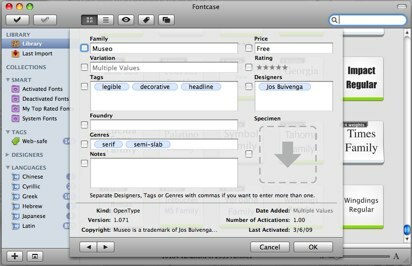 Once imported, you can easily browse and navigate your fonts rating, tagging and organizing as required. The process of scrolling and previewing your fonts is much easier than Font Book. You can even print out previews. Browsing your fonts is also easy. You can quick look a selected font family simply by pressing the space bar. One useful feature is the “compare” button that allows you to compare multiple fonts. I also like the way you can preview a font as body text just in case you are feeling adventurous about replacing Helvitca, although you really probably shouldn’t. If you are on a network with multiple Macs, it also allows you to preview and share fonts through a Bonjour sync. The developers clearly spent some time on the user interface with this application. Fontcase walks that tightrope of having the tools where you need them without looking too cluttered. If you are a font nerd, don’t miss this one. 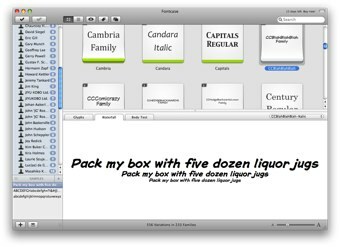 A single license for Fontcase is $56 and a family pack of five is $92. 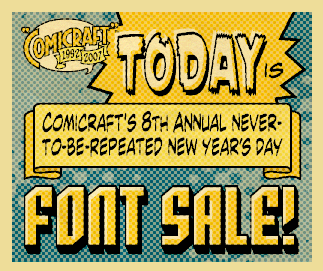 Every year, Comic Book Fonts, runs a font sale. They charge a penny a year for all of their fonts. 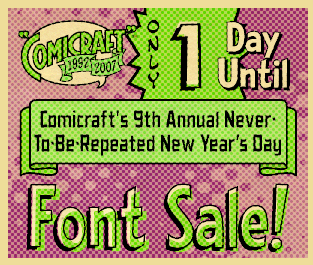 Since tomorrow starts 2009, that means all fonts will cost $20.09. This site has some amazing fonts and I always make a point to buy one on New Year's Day. While I'll never write a comic book, these eye-friendly fonts are perfect for Keynote use. I purchased Hedge Backwards last year and use it all the time. This year I'm looking at Comicrazy. I can't remember if I read it somewhere or heard it on a PodCast, but this morning OmniFocus reminded me of a great sale at comicbookfonts.com. They are charging a penny a year so most of the catalogue is $20.08 today. I really like the Hedge Backwards font. I think I could use this in some of my presentation work. If you are interested, today is the day. You can hear this review on Surfbit's Macreviewcast #120. I have a particular affection for fonts. Back in 1987 I first learned the word "Fonts" when I leaned over a funny looking little beige computer in my college computer lab that said "Hello" when you turned it on. Granted that was a long time ago but the truth is the first thing that really impressed me on the Mac was the way that I could change the screen type. I'm sure I abused this newfound freedom turning in several papers with what could have only been called a font explosion. Does anyone else remember the original "San Francisco" font that bordered on anarchy? So it was with this nostalgia that I installed the FontLibrary Library from MacWare. This package includes some 600 fonts in several categories including refined, classic, designer and creative. In addition to truetype, it also comes with the fonts in OpenType format. 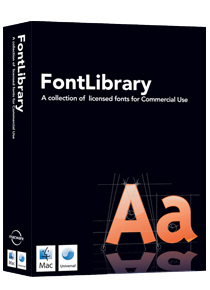 The FontLibrary fonts are licensed for commercial use in printed materials and electronic mediums. You can manage them in Font Book but I liked the included Mac FontManager better which allows you to see all available and installed fonts and move them as you please. Not only does this let you put some of the new fonts on, it also lets you take the existing ones you don't use off. This package really gives you just about anything you could ever need in terms of fonts. I've become a bit more subtle since those early days but occasionally have a need for something unique and this package has it for everyone but the most demanding. It retails for about $50 online.